George, Miles & Buhr, LLC (GMB) worked jointly with the Lewes Board of Public Works (BPW) and the Sussex County Engineering Department to develop preliminary design concepts and cost estimates to determine the feasibility of interconnecting the Sussex County West Rehoboth Sanitary Sewer District wastewater collection system with the Lewes Board of Public Works (BPW) wastewater collection system, thus allowing the County to divert wastewater flow to the BPW Water Reclamation Facility for treatment. GMB facilitated multiple meetings with the BPW and Sussex County Engineering Department during design development allowing for cost-effective design ideas and installation methods to become part of the project. The multiple meeting process allowed GMB to design and create construction documents that ultimately met the goals of the BPW and Sussex County – which included diverting 75,000 gallons per day of wastewater flow from the County collection system into the BPW’s during summer months, and up to 400,000 gallons per day during the winter months. GMB also facilitated and presented design and schedules at public meetings that included nearby residents and other interested residents from the City, the Lewes Chamber of Commerce, and commercial merchants of the 2nd Street corridor affected by parts of the project. A major part of the project was coordinating traffic control and procurement of the DelDOT utility construction permit since a significant part of the project was installed on the DelDOT-maintained portion of Gills Neck Road outside City limits. Finally, upon BPW, Sussex County, DelDOT, DNREC, ODW, and Sussex Conservation District approvals of the final construction documents, GMB provided contractor bid phase, construction contract administration, and on-site daily project representation, ensuring construction met the intent of the project design goals. 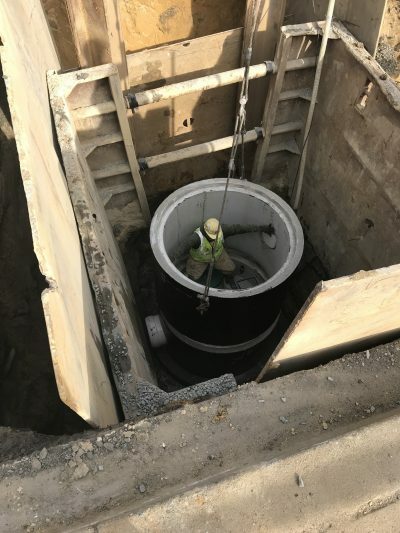 The final project provides transmission of sanitary sewage from an existing Sussex County 16-inch force main located at the entrance of the Wolfe Pointe development on Gills Neck Road, just outside City of Lewes municipal limits, to the existing Lewes Board of Public Works Pump Station No. 4. A new 8-inch/6-inch force main discharges into the existing BPW gravity sewer collection system located on Gills Neck Road near Rodaline Avenue. From that location to Pump Station No. 4, the gravity sewer system on Gills Neck Road was upgraded from 8-inch diameter terracotta clay pipe to 12-inch diameter PVC to accommodate the additional flow and replace an aging collection pipe and manhole system. The project also includes improvements to the gravity sewer within and in proximity to the Savannah Road/Gills Neck Road intersection, including a 164-foot jack and bore of an 18-inch gravity collection pipe in a 36-inch steel casing pipe beneath Savannah Road near the Canal Bridge. The total actual project cost to the Lewes Board of Public Works and Sussex County was $2,407,315 compared to the budgeted amount of $2,757,930 – thus the project was completed significantly below the budgeted amount. This project is unique in that it creates a County/Lewes BPW wastewater interconnection, providing alternatives for processing flows in the Lewes-Rehoboth coastal region. The BPW addressed undersized gravity sewer – decreasing infiltration-inflow and adding capacity to process wastewater from their Service Area. The project required coordination addressing goals of disparate stakeholders – County, BPW, residents, merchants and approval agencies. This project received a 2019 Engineering Excellence Grand Conceptor Award from the American Council of Engineering Companies (ACEC) of Delaware.